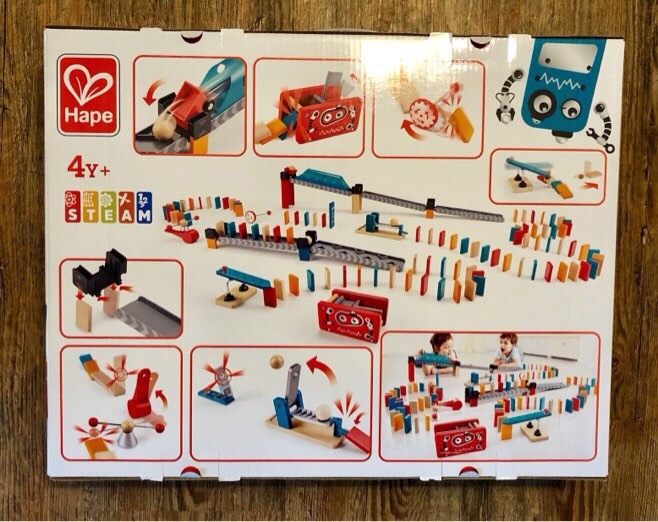 We were very excited to receive this amazing dominos set from Hape to review. Not only is it full of clever domino run additions it also contains wooden balls and it is like a giant marble run. 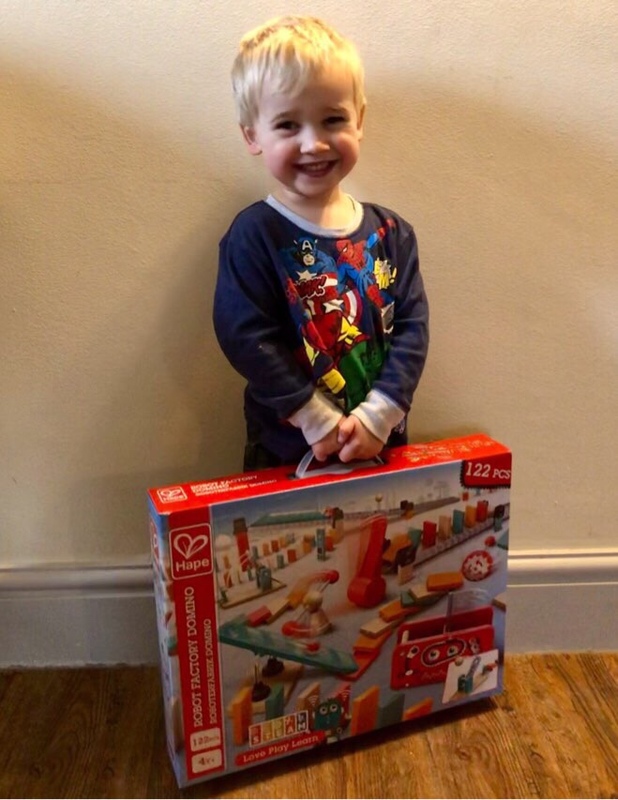 Bow loves marble runs but we have never really played with dominos, other than playing the traditional game. 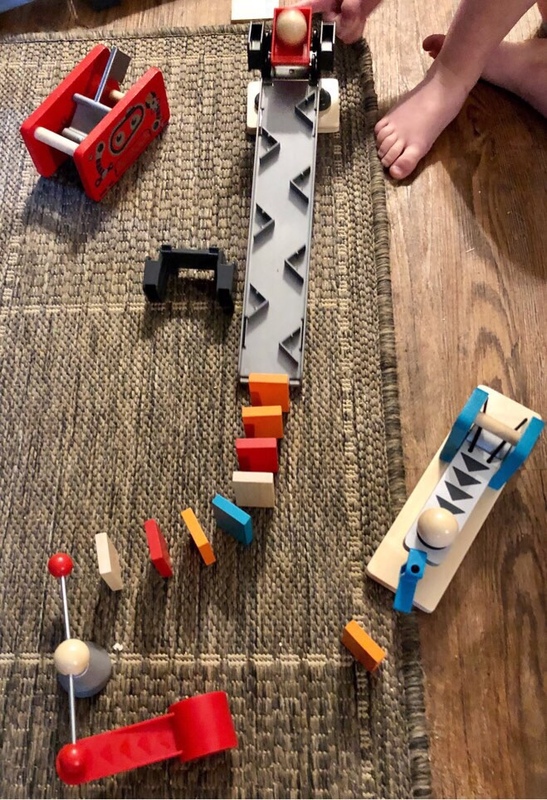 The Robot Factory Dominos set has lots of colourful dominos, a cart and many track pieces that can be used as a smooth run or turned over to make a zig zag path, a tunnel, a great ball launcher that can be aimed to hit a target, a spinner, a rocker, a robot flag machine and much more. We have had hours of fun playing with this set and there is still much more to discover. We have enjoyed setting up mini domino experiments but we have not been brave enough to make a huge domino display yet. I don’t trust Bow not to knock them over before the big reveal. This happened so many times with our little domino runs that we could have easily made an outtakes video. It was funny when it happened with mini runs but I am not sure that Bob and I would feel the same if we had spent ages creating a big display. Here is Bob’s review from her You Tube channel. The Crumby Mummy You Tube channel is no more. Bob has hijacked it and, I must say, she is doing a fabulous job! Bob and Bow love the Robot Domino Factory and Bow asked to play with it every day. It is great fun and, as there are so many different elements, it never gets boring. Disclaimer: We were sent this product free of charge in exchange for an honest, unbiased review.